I want to share a wonderful thing that happened on Halloween night; often called the Devil’s night. 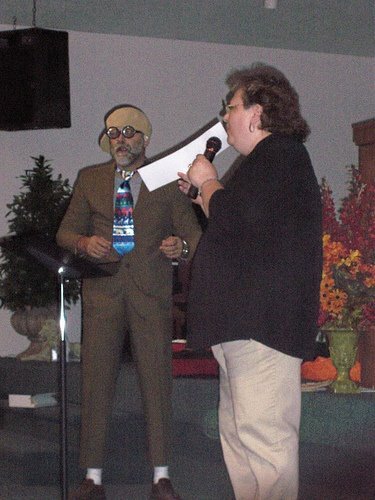 We were asked by Christian Life Center in Spring Lake MI to participate in their annual Harvest Festival. They have a fun evening of carnival type games and free food for their community with a presentation of the gospel at the end of the night’s activities; over 200 hundred people attended this year’s event. Large bags of candy are handed out after the special service so everyone stays for it. Tim and I did a fun skit with Tim appearing as a nerdy and crazy guy named, Willie, who was trying to figure out how to get to heaven. There was much laughter at Willie’s antics as he checked into taking a train or plane to get to heaven. We presented the salvation message at the end of the skit and shared with everyone that Jesus is the only way to heaven; we had 28 children come forward for salvation from their sins that night. In addition, there were several families that came to the event for the first time and filled out cards requesting a visit or call from a representative from the church. We must use every opportunity to reach the lost people of our communities; we were glad to be part of this community outreach.